Located in southern Newark just off I-78 and near the airport, Weequahik Park is a pleasant spot for running in the middle of a highway jumble. The park has lots of facilities: paved paths, trails, a golf course, a lake, and numerous fields. 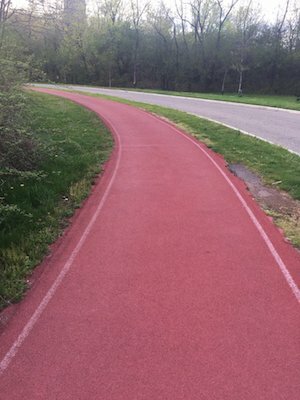 The red rubberized jogging track offers a 1.5 mile loop, pleasantly shaded and with nice lake views. The run can be extended by 1 mile along Thomas Carmichael Dr. on the western side of the park, off Rt. 22.